A few minutes from the heart of the beautiful village of Eygalières, this recently built farmhouse combines a current and refined style with comfort of a very good standard. Made with old materials, the house, bright, opens on all sides on a landscaped garden of 2000 m² and enjoys a magnificent view of the chain of the Alpilles, the old village and Mont Ventoux. This farmhouse of 200 m2 is an invitation to relax. Here, everyone lives in peace. This villa brings an unequaled pleasure to its guests: a refined decoration, services and high-end equipment, beautiful spaces in the heart of the natural park of Alpilles. • Contemporary mas of character decorated with taste and attention to detail. Everything is there to fully enjoy a quiet holiday in an environment of beauty. 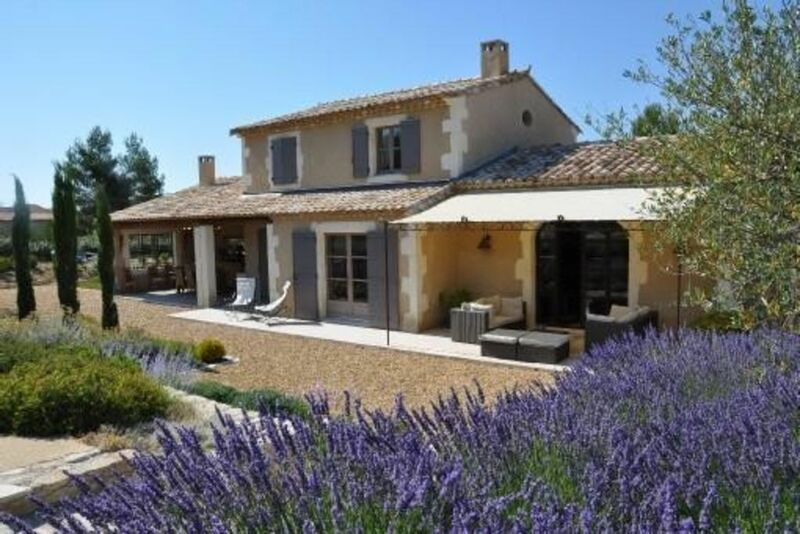 • The farmhouse is located at the foot of the Alpilles where you can walk or mountain bike and 15 minutes walk from the center of the typical Provencal village of Eygalieres. • The Mas is built with quality materials. Floors, windows, fireplace and stone staircase, living room with high ceiling with old wooden beams, marble in the bathrooms, wooden floors in the rooms. The entrance, living room, dining room, kitchen, form a set of 80 sqm. Very nice living room with beautiful fireplace, leather sofas and access to a covered outdoor lounge with sofas and armchairs. Spacious dining room for 12 guests opening onto the terrace. Very nice American kitchen equipped with upscale equipment. 1 triple room (3 beds 90 cm with possibility to gather 2 beds 180, bed linen provided for this purpose) private bathroom (bath, 1 basin stone, wc). Laundry room with washing machine, tumble drier, ironing set. Two rooms, of different decoration, one having three simple beds (90cm) and the other one of a double bed (160 cm), benefit from an impregnable view on the Alpilles and the Mont Ventoux. Both have a spacious private bathroom (shower / washbasins / wc). The farmhouse is built on a park of 2000 m2 with olive trees, lavender, trees and plants of Provence. On a large covered terrace find a fully equipped summer kitchen with hob, barbecue, sink, large wooden table for 12 people. Another shaded terrace is equipped with outdoor sofas. Heated private pool of 11m x 5m secured. Next to the swimming pool shaded by a trellis and deck chairs. Air Conditioning, Dishwasher, Microwave, Induction Hob, American Refrigerator, Small Appliances, Washer, Dryer, Flat Screen TV with Home Theater, DVD, Radio CD Player, WiFi internet connection, Telephone in use restricted reception of calls and local calls, barbecue, garden furniture under the trellis in front of the living room, 10 sunbathing alu with fine canvas, 2 car shelter, bowling, high chair, cot. Internet access, telephone line (reception calls + local calls). Intermediate cleaning included in the case of a stay of 2 weeks. A few minutes from the center of Eygalières, 10 minutes from St Rémy de Provence, 30 minutes from Avignon TGV station, 20 minutes from Avignon airport, 40 minutes from Marseille-Marseille international airport. Provence. The nearest motorway is the A7 (exit Cavaillon) 15 minutes by car, which goes from Lyon to Marseille with connections to all major cities in southeastern France. Notre séjour était tout simplement magnifique ! Le temps était au rendez-vous, la maison était préparée de manière impeccable, le village d'Eygalières est très accueillant....au point où on se demande si on ne reviendra pas l'année prochaine. Ideal location for enjoying southern part of France. Close to the alpilles. The accommodation is perfect to host a couple of families. Quiet, well maintained and spacious. In July 2014 we (2 adults, 2 teenager girls) spent a wonderful week in this great Villa. It was perfectly clean and very well equipped. In reality it is even nicer than on the photos. The decoration is of very good taste and you do not miss any technical support. Gilles via email and Alexandre in Eygalières were very helpful at any time. We will definately come back one day and would highly recommend this place to everyone searching for high qualilty vacation in Provence. There are so many lovely towns, markets and restaurants in this area. It´s amazing!! We have just returned from our second holiday this year in Mas Picholine in Eygalieres and were not disappointed! The house is very spaceous and expertly designed with a lot of thought given to the comfort of guests. It is extremely clean, the decor is lovely and everything possible is provided for you. The owners have paid great attention to detail and quality - the outside lounge furniture is lovely and comfortable and is my favourite place to relax. The gardens and swimming pool are maintained to a very high standard also and are beautiful. Should you need anything while you are there, Alexandre is always on hand and extremely helpful. The house is excellently situated just a 15 minute stroll from the village centre where you will find many restaurants and cafes that provide very good menus from snacks to Michelin star food. Eygalieres is a lovely village and ideally situated. We have spent our holidays in the Dordogne for the past 15 years and this year was out first visit to Provence. it is such a beautiful place and we fell in love with Mas Picholine and Eygalieres - we will certainly be regular visitors for years to come ! What a fantastic home! I highly recommend it. Both the owner and house manager were very accommodating and kind. Two of the house's bedrooms are located upstairs, and two are located downstairs opposite the kitchen and living room. This layout makes the house perfect for two families to share, while feeling that they have their own space. The pool and yard were perfect for my children. The house is located within walking distance of the charming town of Eygalieres (boulangeries, cafes, butcher shop, and small grocery store). It's also centrally located to many of Provence's greatest sites. Nous avons passé une excellente semaine en famille durant les fêtes de fin d’année. La maison est très agréable à vivre et fonctionnelle. De construction récente, la maison a beaucoup de charme notamment par l’utilisation de matériaux nobles et anciens. En plein cœur des Alpilles, l’environnement est exceptionnel et nous en avons profité pleinement au travers de balades à pieds et en vélos. Nous remercions les propriétaires qui au-delà de leur délicate attention à l’arrivée ont fait montre d’une grande flexibilité pour la planification de notre séjour. Nous recommandons vivement cet endroit pour des vacances entre amis ou en famille au cœur d’une région magnifique. Two 18 hole golf courses within 15km.